First things first, my utmost condolences to all those affected by the awful events in Pittsburgh, Pennsylvania today. Nothing like that should ever happen to anybody, regardless of association, for any reason whatsoever. A football game seems completely stupid to consider amidst these circumstances but I’ll try. The victims of today’s tragic events are in our thoughts and in our hearts. The people of Pittsburgh are standing together in love and support of our Squirrel Hill community. I’m trying to be positive here, but, honestly, the “Final Minutes” thing is really the best part. In the worst defensive showing I’ve witnessed in my lifetime, Duke Football lost to Pittsburgh 54-45. Yes, Pittsburgh, and yes, we allowed 52 points and 484 rushing yards. Not even total, that’s rushing alone. We led 42-32 in the almost-end of the fourth (42-35 by the actual end) but it went even further downhill from there. Multitudes of injuries on the defensive side including star CB Mark Gilbert really showed today, but that’s no excuse and we really need to work hard these next few days in preparation for Miami next week. Pittsburgh did not punt once. Looking on the bright side, our offense thrived pretty well for most of the game, only punting once, so hopefully, that momentum will carry against a traditionally stout defense against the U.
Bleed blue. Read my next post! Trust me, it’s way better. It was a baffling game, but Duke was able to leave Atlanta with their fifth win of the season. There are few games where you find three fumbles leading to three touchdowns but that’s exactly how Duke managed to take control of the game. They didn’t exactly play magnificently, but it’s really a testament to the value of a hustle mentality. That’s the fundamentals of football and we executed that properly. Their middle school coaches should be proud. Yikes. Jacob Morganstern was handed an unsportsmanlike conduct penalty but was not ejected, while Tech’s Victor Alexander got the boot for the game. Sorry for the delay in this post. Bleed blue. Countdown is in less than one week. Mark your calendars, people! A better lookout comes for our young offensive line, which will regain an important veteran in redshirt senior C Zach Harmon. Duke will have to do a lot of things right- or at least more things right than against Virginia Tech– to pick up the win in Atlanta. Duke fell to Virginia Tech, 31-14, for their first loss on Saturday, having gone 4-0 earlier in the season. We still have a respectable 4-1 record, but the loss hurts. Duke really didn’t play well, either: Daniel Jones started out looking great, especially coming off the collarbone fracture, but there were a few that looked not-so-great. He simply overthrew to Chris Taylor in the end zone twice, who got his fingertips on it. He was nearly intercepted multiple times, and one the Hokies did manage to pick off and got a field goal off of it. One ray of hope was that drive, actually: Duke’s defense didn’t play well for most of the game, but at the end of that drive Virginia Tech got down into the red zone and we held them there for a field goal. I want to say one thing about Virginia Tech: Whatever happened in that Old Dominion game did not happen last night. They were just about as good as they’ve been in years past. Old Dominion was a fiasco but it’s not a testament to the team’s potential. They are good and OD can’t change that, as much as they’ve shifted the public eye. Virginia Tech’s defense (which OD tore up) was stout in this one, and they stalled Duke’s running game to a grinding halt. They ran up the middle a lot but succeeded more on short screen passes. The running game led to a lot (a lot) of 3rd down scenarios that, if you look below, it seemed only the Hokies were able to pull off. We had just 71 rushing yards, and we average over 230. Virginia Tech’s defense played with a chip on their shoulders and we did anything but, plain and simple. Virginia Tech converted on the most unlikely of 3rd down situations: 3rd and 9, 3rd and 15, all kinds of things that Duke is supposed to defend. Often backup QB Ryan Willis would make us pay for the blitz with a pass that the impressive receivers could get for a first down to extend the drive. We will have to improve our third down defense if we want to succeed under the bright lights, which Duke has not shown an ability to do. This loss is not the end of the world for the Blue Devils. We’re still just two games away from bowl eligibility and we’ve got plenty of games to do that, and we can learn from this game for bigger ones in the future. Daniel Jones did not get hurt all over again- something we worried about as he entered the game just three weeks following surgery. I’m shocked at the number of sources calling this an “upset”: VA Tech is a good team, period. Duke is still a good team, period. This is a bump in the road, plain and simple. Bull City Proud! Bleed blue. Next week we’ve got Georgia Tech: now we can have the mentality of a chip on our shoulders, like Virginia Tech had with us. We need that kind of a game right now. By the way, Three weeks to COUNTDOWN! Wait, what? Now I don’t want to overhype anything, seeing as last year’s 4-0 start was the last of that streak, but I find this pretty darn awesome: Duke is listed by ESPN’s Mitch Sherman as a playoff contender. Now, this guy also says Virginia Tech is “wounded”, which is followed by saying that we could stay undefeated for a while (they’re up next at home), and even a group of beaten-down Hokies is no picnic, so I’m not fully believing him. But hey, he’s been hired by the best sports reporting group in the biz, hands-down, so he can’t be that wrong. And get this: just ten teams are ranked ahead of us. This is great news for a program that, let’s be honest, before the arrival of our savior, David Cutcliffe, was an absolute afterthought. Even with all of the injuries, I truly feel that we can be something good this year. Daniel Jones is officially back and we’ll see how tonight goes. Also, you’ll need an ESPN+ subscription to read this article, but here’s the part we’re looking for: the computer says Duke in the playoffs in simulation 2,173. The odds aren’t great, plus, it’s listed as the “wackiest” outcomes, and the most likely one is that we win out, including the ACC championship. Also included is simulation 4,839 where we go with one loss but defeat Clemson in the ACC championship in dramatic fashion to get in (the author, Seth Walder, made the dramatic fashion part up but with these two teams that’s not unlikely). Bleed blue. Virginia Tech: tonight, 7pm ET on ESPN2. Go Duke. That year was actually a similar situation to this year: the Blue Devils were pretty darn good that year and even made the Pinstripe Bowl Game, but Virginia Tech had struggled a bit that year, during coach Frank Beamer’s final year before retirement. Duke was even ranked at a similar spot to their current one: they were 23rd in the country at the time, which, by coincidence, was the last time Duke was ranked in college football before now. We took the Hokies to four OTs before finally defeating them on a magical two-point conversion by Thomas Sirk. Sirk would go on to transfer after losing the starting spot to his backup, who is now quarterback Daniel Jones. That game promoted Duke to officially bowl eligible. It was thrilling to watch. Now Duke faces the Hokies in a similar yet slightly different situation: this time we’ll be at home, and Tech, who was previously ranked thirteenth, is coming off a stunning loss and a fall from the rankings after being shocked by Old Dominion. No, that’s no typo. 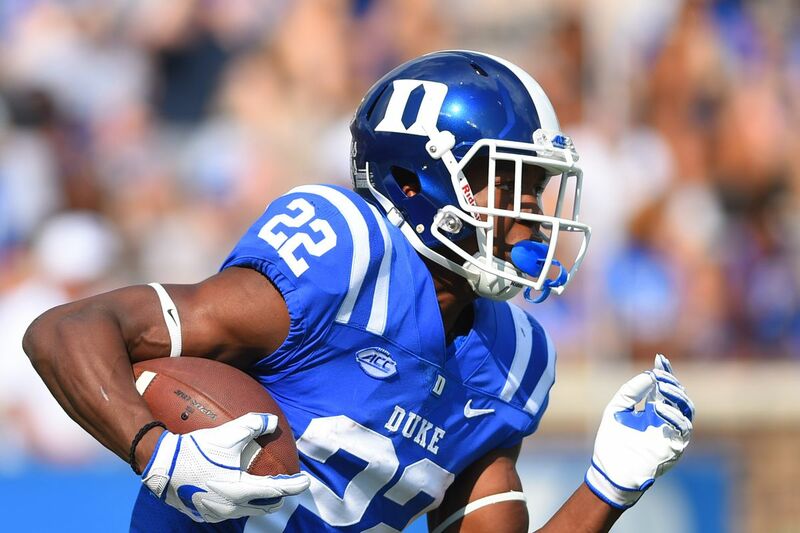 Duke has faced injury woes this season, from quarterback Daniel Jones’s broken collarbone to cornerback Mark Gilbert’s dislocated hip. It’s all been not-great luck for us, but the backups have stepped up to the challenge and have done well against Baylor and NCCU. Virginia Tech, despite the loss of starting quarterback Josh Jackson, is easily one of the most intimidating opponents we’ll face all season and it’s time for some guys to step up. If you watched the highlights of the 2015 Duke vs. Virginia Tech matchup, you probably saw that Shaun Wilson 58-yard run. Last year was Wilson’s final year as a Blue Devil, but fellow running back Brittain Brown, who shared touches with Wilson during his final year, has made himself into a star this year and he could have a big game in a big game. Old Dominion torched a usually stout defense, and hopefully Brittain Brown can find some routes to get the Duke offense rolling before Virginia Tech can figure too much out. On the defensive end of the field, Joe Giles-Harris is one of the best linebackers in the game. He plays the weakside and against Northwestern racked up 9 tackles! We need him, big time. Matthew Hurt Is A Blue Devil!